I was so excited to use Bo Bunny's new Glitter Paste for the first time, with this card that I made using Bo Bunny's Sweet Life I Want It All Bundle from FotoBella! 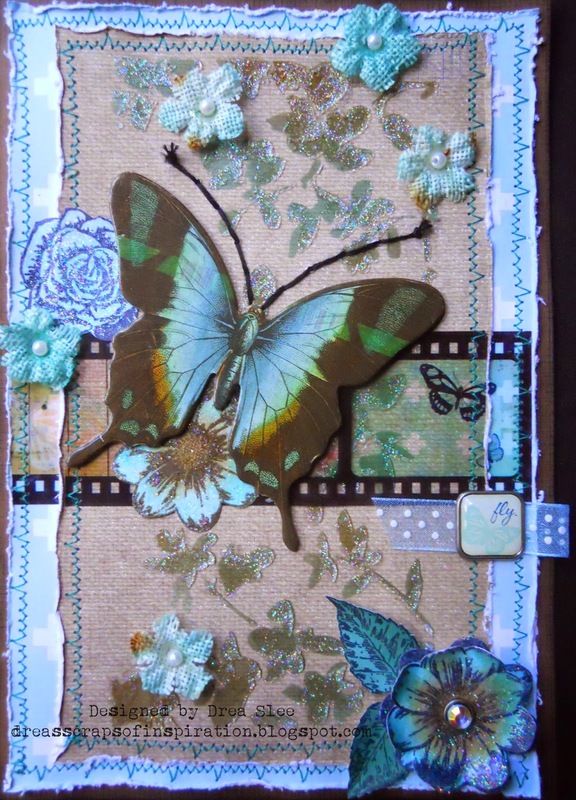 The colors and inspiration all came from this beautiful, chipboard, butterfly, which is probably my favorite piece from the whole bundle! 1. Cut card from brown cardstock at 5 3/4" X 8 1/4". Cut 4 1/2" X 7 1/2" from "Inspire" paper. 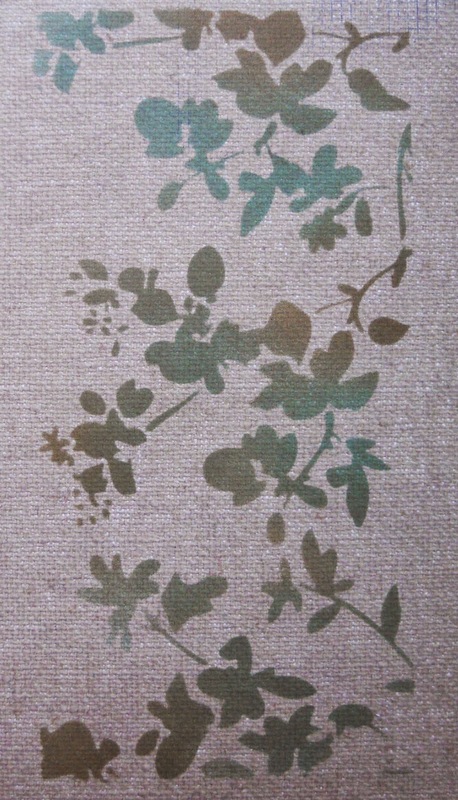 Center Blossom Stencil over the paper and use a blending tool to ink it with Distress Inks (Frayed Burlap, Gathered Twigs, and Evergreen Bough). 2. Clean stencil and place it over your masking, matching up the pattern that you just inked. Now apply the Glitter Paste and remove stencil. 3. 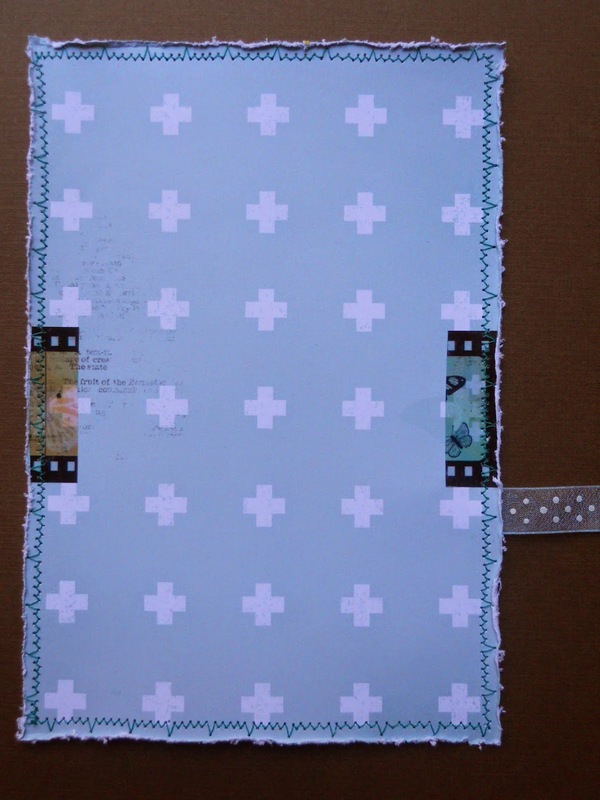 Cut 5 1/2 " X 8" from the back of the "Dot" paper, and use the Paper Distresser around all the edges, along with the masked paper. 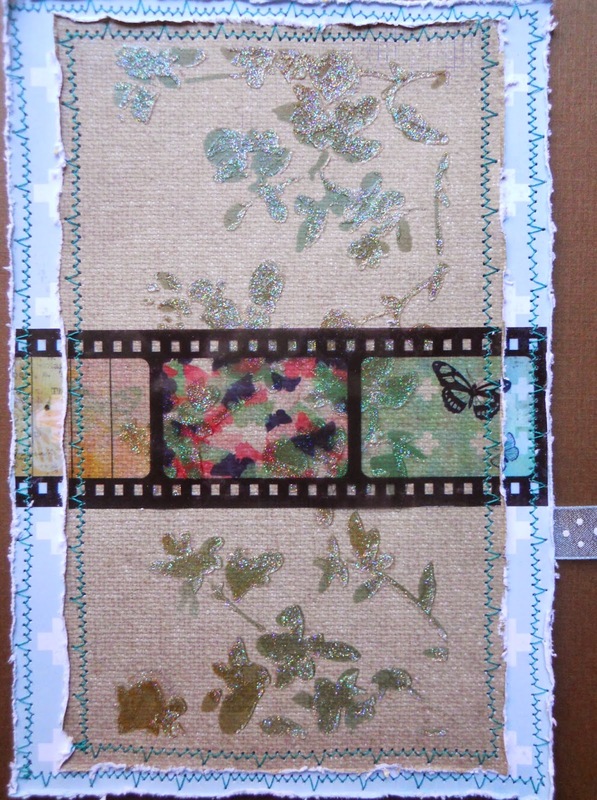 Cut about a half inch from the ends of the Film Sticker and place along the distressed edges. Glue the sheer ribbon from the Ephemera to the back of the paper, right under the Film Sticker on the right. Stitch around the edges. 4. Glue the masked paper onto the blue paper, and adhere the center of the Film Sticker right over the masking. Sew the edges, which will ensure the sticker stays in place, and make sure to stitch through the ribbon. 5. 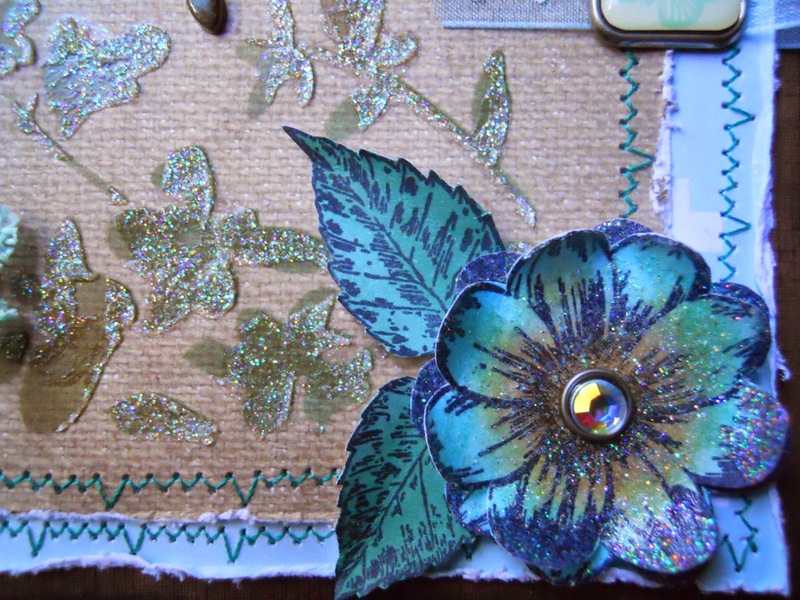 Stamp, ink, and fussy-cut some flowers with the Bo Bunny Floral Stamp. I inked mine with Distress Inks (Tumbled Glass, Peacock Feathers, and Frayed Burlap), and added some Glitter Paste to them. 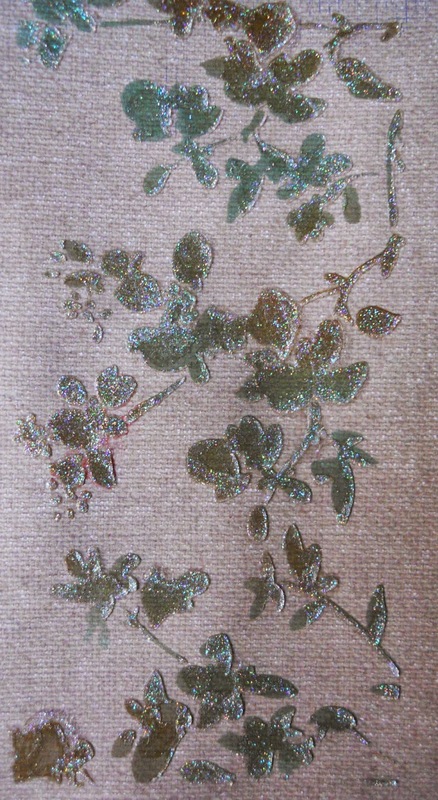 If you don't have the Floral stamp you can always fussy-cut some of the beautiful flowers from the papers. 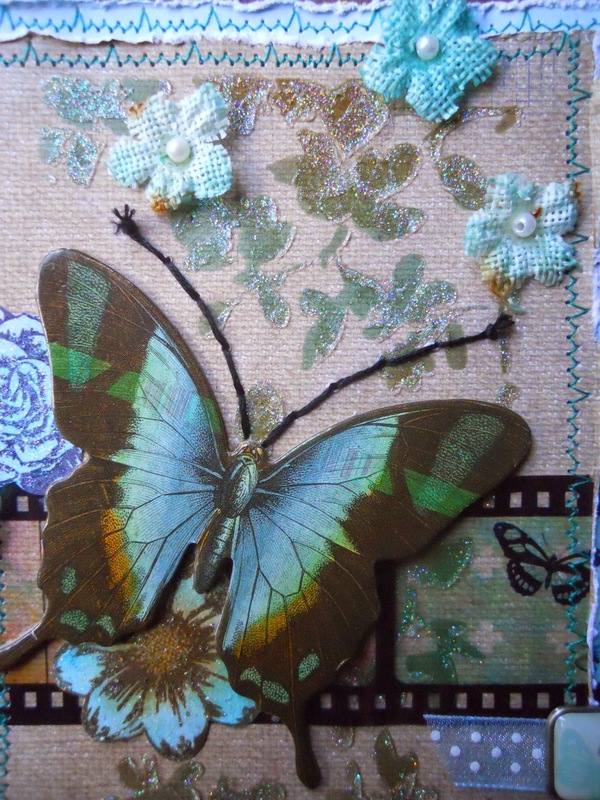 I didn't want the pink butterfly section of the film sticker to show, so I covered it with a stamped flower, and added the chipboard butterfly to it. I hand-stitched the antennae, and gave it a shabby chic look, by putting my knot in the front, and fraying the ends of the black embroidery thread. 6. I curled the petals up on the flower in the bottom corner and attached the bling brad to the center. To create a loop from the ribbon, just fold it over to the left of the Film Sticker and add the square, fly brad. Scatter some of the burlap flowers around the blossoms, and to finish it up, add your layers to the brown card, inking the edges with Black Soot Distress Ink.